Description: CDV of a young boy's bust. He is wearing a wool plaid jacket with buttoned chest. Description: Cabinet card of an unidentified man's bust of the Clarke family. The man's hair is parted and slicked. He has a waxed handlebar mustache. Visible in the frame is his collar; tie with pin, and collar of his jacket. The photo has a trompe l'oeil effect. The photographer, Lafayette Sheppard, was only in Petaluma for one year in 1888. 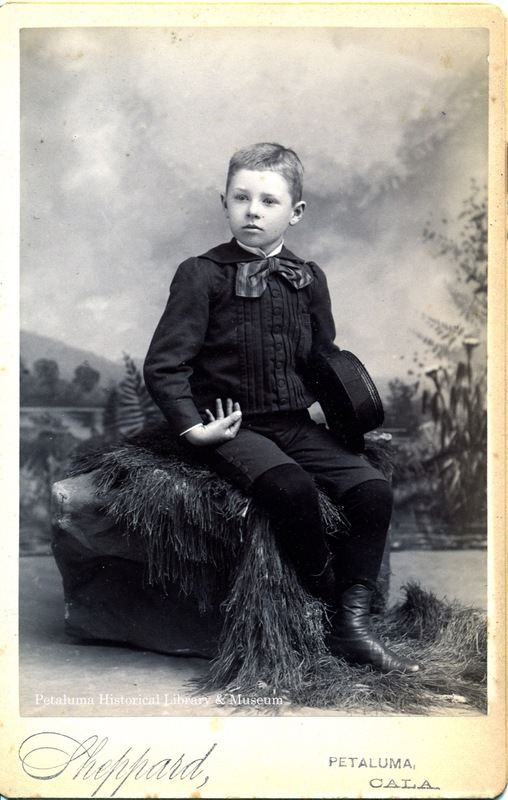 Description: Cabinet card of a boy in a “Lord Fauntleroy” outfit holding his hat, and sitting on a studio prop hay bale. Description: Cabinet card of 2 boys, and 2 girls--all unidentified. 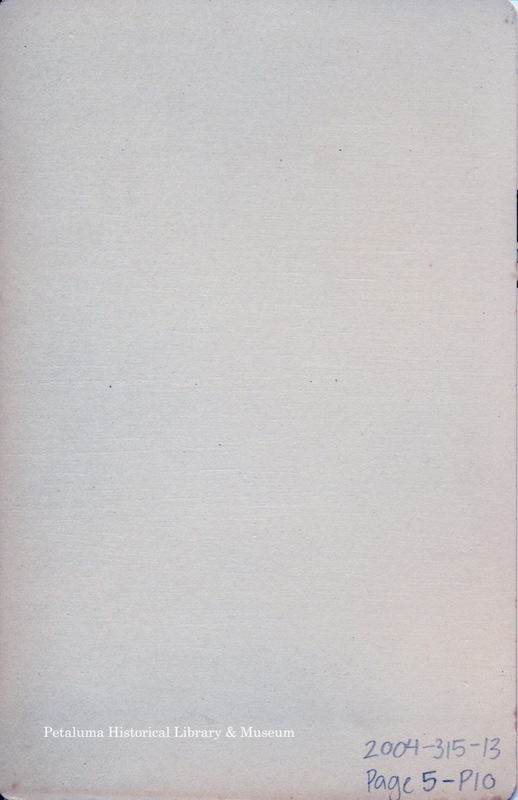 The card has beveled edges. The girls appear to be wearing identical dresses with white bows at the neck. The older, standing boy has on a suit, while the other has on child's clothes. The photographer, Lafayette Sheppard, was only in Petaluma for one year in 1888. Description: Cabinet card of two young unidentified girls. The girls are sitting on a fake studio prop rock. They are both wearing almost Asian-inspired coats and hats. The younger girl's outfit is white, while the older girl's jacket is darker with floral patterns, and what appears to be velvet around the cuffs and collar. The photographer, Lafayette Sheppard, was only in Petaluma for one year in 1888. Description: Cabinet card of an infant sitting on a blanket covered studio prop. The infant is wearing a communion gown. Description: Cabinet card of an infant sitting on a studio prop sofa. He is wearing a striped gown and is holding something, a toy perhaps, in his hand. 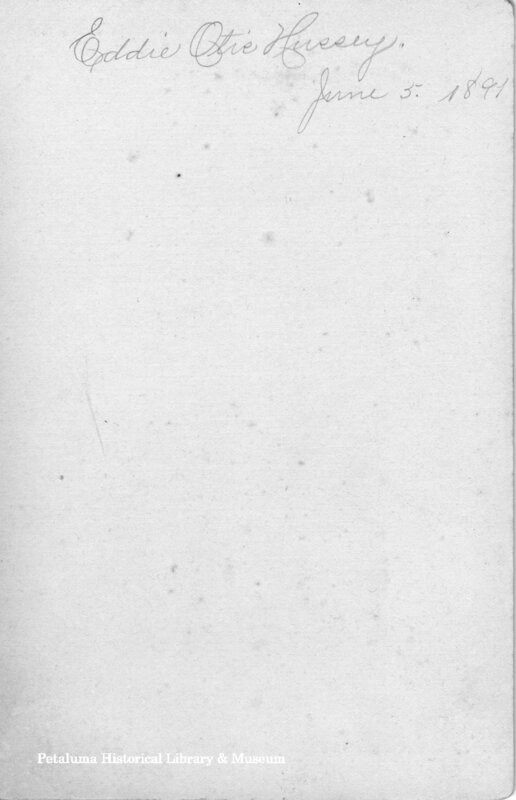 Description: Cabinet card of a man's bust in a trompe l'oeil effect of a curling scroll. The man has a moustache, and is wearing a suit with a pin at the base of the tie. Description: Cabinet card of an unidentified young man's bust. The man's hair is parted and combed. Visible in the frame is the man's three-piece suit, with pin, tie, and up-turned collar. The photographer, Lafayette Sheppard, was only in Petaluma for one year in 1888. Description: Maroon cabinet card of an unidentified young man's bust. The man's hair is parted and combed. 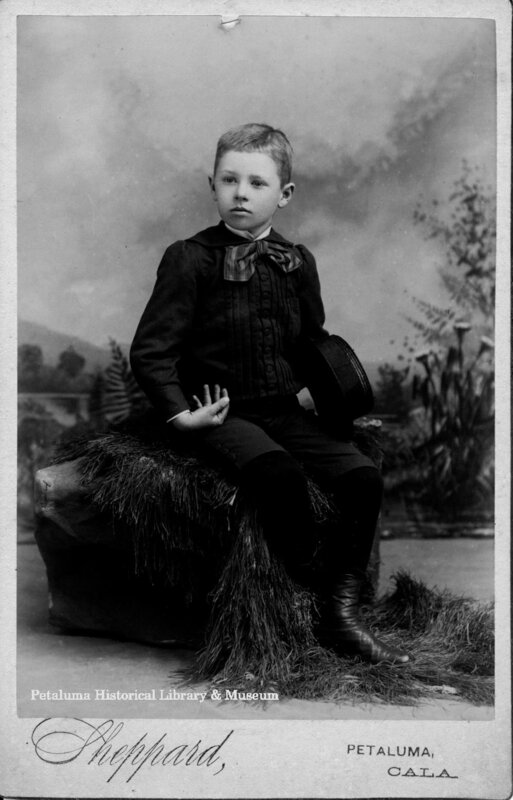 The photographer, Lafayette Sheppard, was only in Petaluma for one year in 1888. Description: Cabinet card of an unidentified young man's bust in an oval frame. The man's hair is parted and combed. Visible in the frame is the man's tie and jacket, which appears to be buttoned only at the top, characteristic of the 1880's. The photographer, Lafayette Sheppard, was only in Petaluma for one year in 1888. Description: Cabinet card of an unidentified young man's bust. The man's hair is parted and combed. Visible in the frame is the man's suit, and tie, with an up-turned collar. The photographer, Lafayette Sheppard, was only in Petaluma for one year in 1888. Description: Maroon cabinet card of an unidentified young man in a trapezoid frame. The man's hair is parted and combed. Visible in the frame is the man's suit, and tie, with only the top button fastened, characteristic of the 1880s. The photographer, Lafayette Sheppard, was only in Petaluma for one year in 1888.